Create (or Navigate to) a folder of your choice where you would want to place lab. Extract the ZIP file you downloaded to this folder. A description of the files and folders found in this ZIP file can be found here. Under the current folder, create a folder structure dev/audio_sine_tone. The lab will be developed in this folder. The Atmel Studio will create a sub-folder audio_sine_tone_lab inside dev/audio_sine_tone. 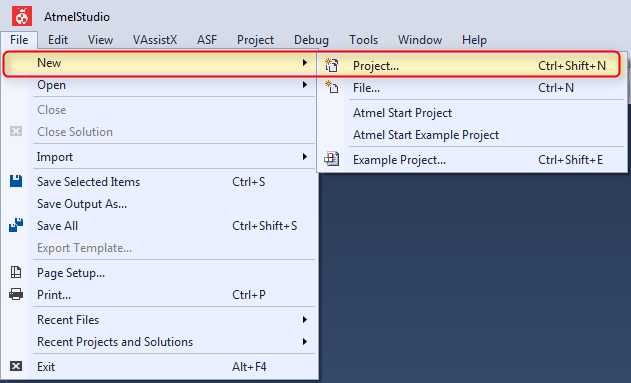 Start Atmel Studio and create a new project by selecting File > New > Project. 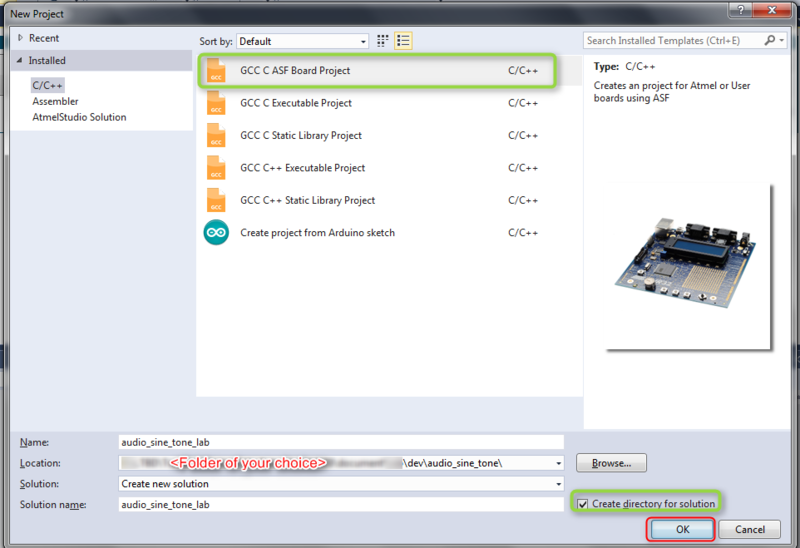 In the New Project dialog, select GCC C ASF Board Project. After clicking OK, the Board Selection dialog will be opened. In the Board Selection dialog, Choose 'Select By Device' radio button, and select SAMV71 from the 'Device Family' drop down menu. 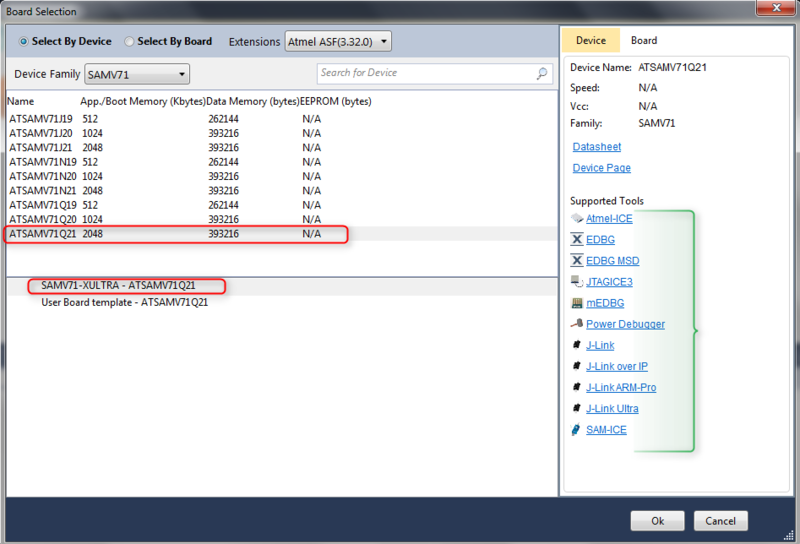 Clicking on device name ATSAMV71Q21 will show the names of the supported boards for the selected device. Select the board to be used by clicking on SAMV71-XULTRA - ATSAMV71Q21 and press OK button. Notice the various supported Debug Tools in the right pane of the Board Selection dialog. The board SAMV71-XULTRA - ATSAMV71Q21 is shipped with EDBG firmware, therefore EDBG could be used as the programming/debugging tool. After clicking the OK button, the project will be created and opened. 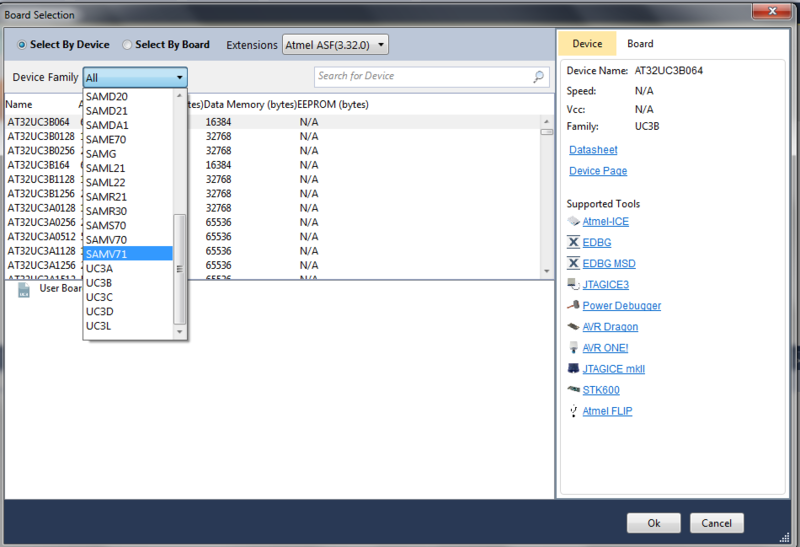 You will see the ASF Wizard dialog and the Solution Explorer on the right pane.